Watch Collingwood's General Manager of List Management Derek Hine explain the five-way trade. Watch General Manager of List Management Derek Hine explain the five-club trade that saw Collingwood recruit Travis Varcoe (Geelong), Levi Greenwood (North Melbourne) and Jack Crisp (Brisbane). Travis Varcoe is one of three readymade players to join Collingwood during the October trade period. Collingwood today completed a five-way trade that will see three players arrive at the Westpac Centre and a top five draft selection pass into the club’s possession in exchange for Dayne Beams and Heritier Lumumba. North Melbourne’s Levi Greenwood, Geelong’s Travis Varcoe and Brisbane’s Jack Crisp have become Magpies and pick five in next month’s National Draft has become Collingwood’s second top 10 selection. The deal is completed with Beams and a fourth round pick (No. 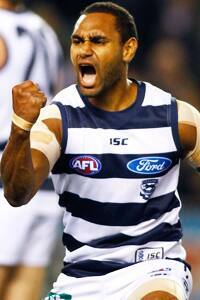 67) moving to the Lions, Lumumba crossing to Melbourne and Mitch Clark leaving the Demons for Geelong. VIDEO: Watch General Manager of List Management Derek Hine explain Collingwood's moves at the trade table. The deal meets Collingwood’s immediate needs and furthers the club’s strategic aim of continuing to invest in the draft. Collingwood emerges with two inside midfielders (Greenwood and Crisp), a line-breaking premiership player (Varcoe) and access to two top 10 national draft picks for the second consecutive year. The club has already invested pick No. 9 in the upcoming draft on under 18 All-Australian father-son prospect Darcy Moore. Collingwood chose Matthew Scharenberg (No. 6) and Nathan Freeman (No. 10) in 2013 and selected Brodie Grundy (No. 18), Ben Kennedy (No. 19) and Tim Broomhead (No. 20) in 2012. Once the 2014 national draft is over, and with Taylor Adams (No. 13 for GWS in 2011 before being traded to the Westpac Centre in 2013) included in the group, Collingwood will have introduced eight first round draft picks to its squad over the last three years. VIDEO: General Manager of List Management Derek Hine explains the process behind the move of Dayne Beams to Brisbane. The acquisition of Greenwood (74 matches), Varcoe (138 matches) and Crisp (18 matches) deepens the Collingwood midfield and offsets the loss of experience through the departures of Beams (110 matches) and Lumumba (199 matches). Greenwood enjoyed a breakout season with the Kangaroos this year and finished one vote shy of winning the Syd Barker Medal. Playing 22 matches, the 25 year-old ranked among the side’s leading players in a host of statistical categories, including disposals per game (2nd – 25), inside 50s per game (2nd – 4.2), total clearances (3rd – 89), marks per game (4th – 5.4) and total tackles (4th – 107). Crisp played the last six matches of Brisbane’s season and averaged almost 20 possessions and a goal across that run while Varcoe is a two-time premiership player who has shone on the biggest stage. VIDEO: Watch Travis Varcoe's career highlights. “With Dayne and Heritier leaving, our objective was to make sure the team remained in a position to play finals in 2015 while continuing to build a critical mass of elite talent. I think we have achieved that,” Collingwood’s General Manager of List Management, Derek Hine, said. “Levi Greenwood is a hard-nosed midfielder who moved into serious centre square company this year. Travis Varcoe has speed, carry, a fine kick and big game success in his repertoire and we managed to get hold of Jack Crisp who is an emerging 190cm midfielder with good speed and endurance, a good inside game and a developing outside game. Collingwood Director of Football, Rodney Eade, thanked Beams and Lumumba for their significant contributions to the club, notably their roles in the 2010 premiership. VIDEO: Watch the best of Levi Greenwood's 2014 season with North Melbourne. The charismatic Lumumba forged a 10 year career in black and white out of a chance he took to chase, at his own expense, a place on the club’s rookie list. The 27 year-old became a constant in the senior side for the best part of eight years and has accepted the security of a long term deal with the Demons. Beams sought a transfer back to his native Queensland for family reasons. The 24 year-old mid-fielder joined Collingwood as a second round draftee in 2008, made his debut in 2009, played in the 2010 premiership as a flanker and blossomed into an A-grade midfielder under coach Nathan Buckley in 2012, when he won the Copeland Trophy and an All-Australian jumper. VIDEO: Watch Jack Crisp's best highlights from his time at Brisbane. “Collingwood was good for Heritier and Dayne and they were good for Collingwood,” Eade said. Collingwood will take picks No. 5, No. 8 (Darcy Moore), No. 30 and No. 48 to the November 27 National Draft which will be held on the Gold Coast. VIDEO: Meet Darcy Moore, who joined Collingwood under the father-son rule last week. VIDEO: Watch some of the best players to be selected with pick No. 5 in the past 20 National Drafts.